Shakti Yoga Dances emerged from aspects of a Practice that engage me personally, and as a teacher. They have a strong physical flow, are integrated with many of the subtle systems that profoundly connect the emotional body. A mystical alchemy occurs when layers link. Often ordinary Self and extraordinary Self collide, and I love sharing that magical crossroad. Combining Pranayama, alignment, mudra and chant, these dances bring us together in discovery and acceptance, creating joyous, sometimes profound dialogues, both external and internal. I teach the class I want to take; a strong physical flow, connected by unusual links, and integrated to hold intention, healing, and longing. Surprises occur when awareness, music, community, spirit and laughter support the body. My transformations have come from listening to my inner voices, and remembering who I really am. 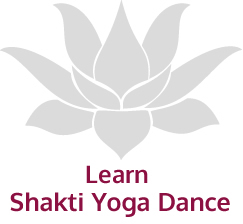 Shakti Yoga Dances offer that to others -without having to explain. Through the dances, we integrate anata, a sense of wholeness. When you feel that, you emanate bliss. This Practice of preparation and repetition is rigorous, and resilient enough to hold strong emotion, loose enough to include many confluences. I love offering a safe vehicle where we freely express, and easily attune to cyclical shifts, not only in the seasons, but lunar-solar relationships, as well as emotional events. As our world shape-shifts, we are being asked to weep and celebrate together. Yoga is life, and what happens in class is about life. Shakti Yoga Dances are visceral expressions of this life.